A question I get often, especially around solutions where security is a big concern is “how can we see who looked\opened\updated\deleted an item in our document library. Updates, are easy if you have versioning enabled as it tracks each update in the version history, but what if you don’t want versioning enabled or you need to track the other items? Enter SharePoint audit reports. I previously blogged a detailed post on the audit logs within SharePoint. Basically, once enabled they will record everything that occurs within the site depending on the settings you select. You can find more information on it here. However, the problem with audit reports is you need site collection admin access to see them. This does not work in many instances as most end users don’t (and shouldn’t) have that level of access to your site collection. So how do you get them the reports without manually running the report for them each time they require it? This is what we are going to cover in this series. This post specifically will assist you in preparing the data for your users from the SharePoint GUI. SharePoint People Picker Error – Item cannot be more than 256 characters. Had a colleague ask me the other day if there was a limit on the People Picker control in SharePoint. 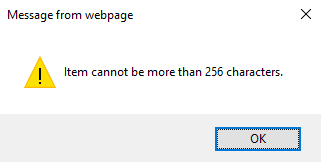 Reason being is that she had a Person field setup to accept multiple users and had a group that was constantly getting the error “Item cannot be more than 256 characters” when trying to enter the users. After a bit more digging, found out they were using a list of about 20 people or so and then just pasting them into the people picker box. They had everything correct with semicolon separators and everything, but kept getting that error. The other day I decided to start a power user best practice series. I started with site columns and now the next logical step is content types. I have found that many times experienced users don’t realise the importance of a properly setup content type. Because of this, they often are recreating the same data, having to redo the content types and in some cases blow them away and start over (both of which are a real pain if the CT is already being used). The intent of this post is to cover the best ways to create your content types. So today I am starting a new series on SharePoint Best Practices. This may seem like a fairly simple topic but, I have come to learn that it is an important one. I am not talking about best practices in setting up and configuring SharePoint or how to best develop a solution in SharePoint. I am instead wanting to discuss best practices in your day to day usage of SharePoint. Too many times I have worked with experienced clients that have a decent knowledge of how to do things in SharePoint, but don’t think of the little things that make these best practices. This is where this series is coming from. Today I am going to cover site columns. Years ago when Microsoft released it’s latest version of SharePoint Designer, it came with a few enhancements that really made building workflows with Designer more robust and efficient. One efficiency enhancement was the ability to copy actions, steps and even entire stages within the same workflow or even between workflows. Microsoft also allowed for the ability to move back and forth between stages instead of continuing down a parallel path (called a state machine workflow). While the addition of state machine workflows to Designer (previously only available in Visual Studio workflows) is great; in my opinion the best (by a very small margin) addition to Designer is the ability to call web services. As your queries get more and more complex however, knowing what is coming back into the workflow can be filled with frustration as you try to determine how to get the data from the response content. While I it isn’t a new concept, I wanted to discuss handling REST responses in SharePoint Designer workflows. Or at least how I do it. The method I use is pretty straight forward and very easy to implement.